According to satellite imagery, Mora’s maximum surface sustained winds were about 83 km/h (52 mph) with gusts to 102 km/h (63 mph). The estimated central pressure was about 992 hPa. The system is likely to intensify further into a Severe Cyclonic Storm during the next 12 hours, the center said. 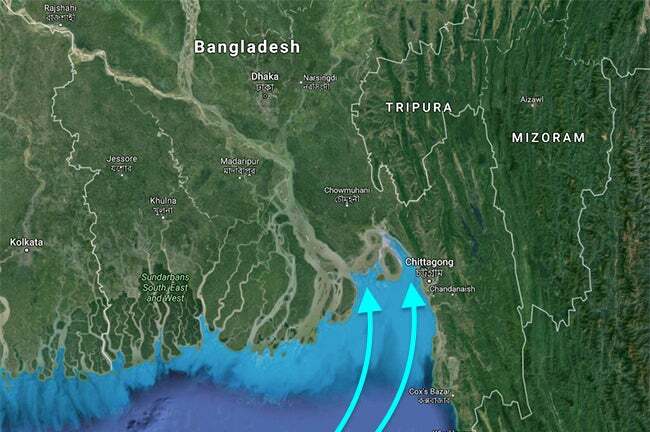 It is very likely to move north-northeastwards and cross Bangladesh coast near Chittagong on May 30 (morning, local time). The severe cyclonic storm ‘MORA’ (ecp 990 HPA) over north Bay and adjoining east central Bay moved slightly northwards and lies over the same area (near lat 19.5°n and long 91.3°e) and was centred at midnight last night (the 29 may 2017) about 305 kms south of Chittagong port, 230 kms south of Cox’s bazar port, 380 kms South-Southeast of Mongla port and 300 kms South-Southeast of Payra port. It is likely to intensify further, move in a northerly direction and may cross Chittagong – Cox’s bazar coast by morning of 30 may 2017. Under the peripheral influence of severe cyclonic storm ‘MORA’ gusty/squally wind with rain/ thunder showers is likely to continue over north bay and the coastal districts and maritime ports of Bangladesh. Maximum sustained wind speed within 64 kms of the cyclone centre is about 89 kph rising to 117 kph in gusts/squalls. Sea will remain high near the system. Maritime ports of Chittagong and Cox’s bazar have been advised to keep hoisted great danger signal nubmer ten (r) ten. Coastal districts of Chittagong, Cox’s bazar, Noakhali, Laxmipur, Feni, Chandpur and their offshore islands and chars will come under danger signal number ten (r) ten. Maritime ports of Mongla and Payra have been advised to keep hoisted great danger signal nubmer eight (r) eight. Coastal districts of Bhola, Borguna, Patuakhali, Barisal, Pirozpur, Jhalokathi, Bagherhat, Khulna, Satkhira and their offshore islands and chars will come under danger signal number eight (r) eight. Under the influence of the severe cyclonic storm ‘mora’ the low-lying areas of the coastal districts of Cox’s bazar, Chittagong, Noakhali, Laxmipur, Feni, Chandpur, Borguna, Bhola, Patuakhali, Barisal, Pirozpur, Jhalokathi, Bagherhat, Khulna, Satkhira and their offshore islands and chars are likely to be inundated by storm surge of 4-5 feet height above normal astronomical tide. The coastal districts of Cox’s bazar, Chittagong, Noakhali, Laxmipur, Feni, Chandpur, Borguna, Bhola, Patuakhali, Barisal, Pirozpur, Jhalokathi, Bagherhat, Khulna, Satkhira and their offshore islands and chars are likely to experience wind speed up to 89-117 kph in gusts/ squalls with heavy to very heavy falls during the passage of the severe cyclonic storm. Forecast Path : The red-shaded area denotes the potential path of the center of the tropical cyclone. Note that impacts (particularly heavy rain, high surf, coastal flooding) with any tropical cyclone may spread beyond its forecast path. Torrential rainfall is expected along, north and to the east of the track over eastern Bangladesh, northeast India and western Myanmar, extending northward to the foothills of the Himalayas. This includes the Bangladesh capital of Dhaka, home to over 10 million, one of the world’s most densely populated cities. This heavy rainfall extending well inland could trigger life-threatening flooding and, in mountainous areas, mudslides. Much heavier rain may occur where rainbands train across the same area for several hours. Of the 12 tropical cyclones on record that have claimed at least 100,000 lives, eight of those formed in the Bay of Bengal, according to Weather Underground. One of these, the infamous Great Bhola Cyclone, killed at least 300,000 in November 1970, the world’s deadliest tropical cyclone of record. In more recent times, Cyclone Nargis in 2008 devasted the Irrawaddy Delta region of Myanmar, claiming at least 130,000 lives. Less intense storms have also been very deadly in the region. In 2015, a tropical storm-strength cyclone, Cyclone Komen, hovered near the coast of Bangladesh and brought flooding rain to six countries that killed nearly 500 people. Cyclone Komen made weeks of heavy rainfall even worse as landslides occurred in Myanmar, and more than a million people were evacuated or displaced from Myanmar alone.